Golden Apples: Double Knitting & ThinkPink! Another Repeat of the Stripe Pattern Complete. My Stash needs to be reduced to sable. 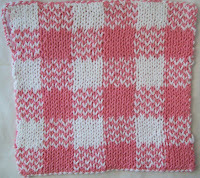 Lately, for reasons I can't fathom, my double knit gingham potholder—a pattern of mine that was added to Ravelry before I had joined Ravely—has been generating a huge number of hits on my blog. This Pattern, and the patterns for some cup cozies (or bottle cozies, as seen here) are still being edited, and not yet ready—but if you are interested, be sure to check back later (next week! )-All of these patterns will be free, and with permission, can be copied and distributed to groups doing charity knitting for breast cancer fund raising—just write and ask for permission—and keep my name and email link on the print outs! Other knitting? Well the socks, last seen here, are now 2 inches longer, and just 1 inch or so away from toe shaping. There are still heels to knit after the toes are done, but it won't take long to finish them, and finish them I must, if I am going to have my halloween socks done by the end of the month! I have a few ideas for halloween socks—1: candy corn, (and maybe jack-o-lantern and ghosts) stranded knitting design in cuff and leg, 2; a self striping yarn in purples, black and orange stripes, 3: pumpkin colored socks (with or with out some design element in cuff). Halloween comes every year, and it's one of my favorite holiday, so having special socks for 1 day of the year (or 2 or 3 pairs for this one day, so I can wear different sock and only repeat ever 2 or 3 years) is not unreasonable—well not unreasonable for a person who already has over 4 dozen pairs of socks, and is still interested (an has yarn for!) as many more pairs! Candy corn socks! I love it. It's always good when you get random hits on your blog. I'm a fan.